Castle Comfort Stairlifts offers top brand stairlifts, keen prices and fast installs for all those seeking stairlifts in Cornwall. And all work comes with our no-quibble guarantees and famous customer service satisfaction. Castle Comfort Stair Lifts are heading back 'up country' today. We've left Penzance behind and are heading for Truro, the only city in Cornwall and the most southerly city in the UK. If you are looking for a stairlift in Cornwall either for yourself or a family member, look no further than Castle Comfort Stair Lifts. 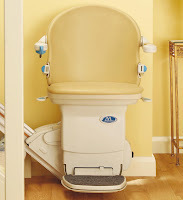 We are the national agent for all makes of stairlift and we can help you choose either a brand new straight or curved one or even a reconditioned one. Just watch our video and then give your local office a call for more information on 01395 349198. On with our tour of Truro and to meet some Truronians as the people from this city in Cornwall are known! We've travelled 27 miles from our last stop Penzance but find ourselves closer to previous stops Falmouth (10 miles away) and St Austell (14.5 miles away). Truro is a typically pretty Cornish town with cobbled streets and some Georgian architecture. It is also a port once important in the fishing industry back in the 14th century, secure in its almost inland location, some 9 miles from the coast. It is up a creek where the Rivers Kenwyn and Allen converge to form the River Truro later joining the River Fal and on into the large natural harbour of Carrick Roads mentioned in our tour of Falmouth. The town later became important in the local tin mining industry as an official assaying and stamping of locally mined tin and copper. Truro is now the retail centre for Cornwall with a wide variety of national chain stores, independent shops and markets. It is also quite a cultural centre with many community events occurring throughout the year such as a half marathon, a city carnival which includes a parade of course, a circus, music and other performances, fireworks and food and drink fairs. Christmas time sees a Winter Festival which includes a parade of Paper Lanterns which many of the community have made. and Matthew Etherington who now plays for Stoke City – HQ of Castle Comfort Stair Lifts, national agent for all stairlift manuacturers is also from the town. Truro seems to have bred a whole team of cricketers including Paul Berryman, Nicholas Carter, Neil Curnow, Ryan Driver, Ben Frazer, Matthew Gitsham and Robert Brooks; astronomer Edwin Dunkin was also from Truro; our first woman, Helen Glover a silver medal rower was also born in Truro as was another rower Annabel Vernon. Lady body builder Joanna Thomas is also from here and well known author Robert Goddard lives in Truro. The drummer Roger Taylor of the band Queen is also from here. Here at Castle Comfort Stair Lifts we hope you've enjoyed this armchair tour of Truro in Cornwall. Remember if you or a loved one is looking for a stairlift, we can advise on the most suitable one for your needs. If you need help funding the purchase or a 0% finance option, we can also advise. Please give us a call on 01395 349198 to discuss just how we can help you. Or if you are a commercial venture looking for passenger lifts or wheelchair lifts, Castle Comfort Stair Lifts are happy to advise and supply. Please call us on the same number. I love Cornwall -And I love Roger Taylor from Queen - but I loved Freddie more ! If only Castle Comfort Stairlifts could have helped him in his last days.